Looking for a treat to enjoy with a cup of coffee or tea? 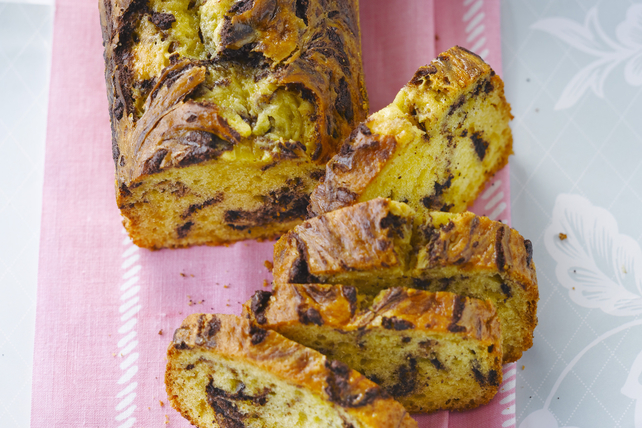 Why not try our Vanilla and Chocolate Quick Bread? This yummy bread is made with on-hand ingredients so you'll likely not need to make an extra trip to the grocery store. Combine flour, baking powder and salt. Beat butter and sugar in large bowl with mixer until light and fluffy. Add eggs, 1 at a time, mixing well after each addition. Blend in milk and vanilla. Gradually add flour mixture, mixing well after each addition. Stir in chocolate. Bake 50 to 55 min. or until toothpick inserted in centre comes out clean. Cool in pan 15 min. Remove from pan to wire rack; cool completely. Add 1/2 cup of toasted chopped pecans, walnuts or hazelnuts when you stir in the chocolate.